1986; 192 pages. Genre : Science Fantasy. Overall Rating : B-. Talking Man is a wizard. But he is also a dreamer. Along with his soulmate, Dgene, they dreamed this universe into existence. Then Talking Man fell in love with his creation. So he hid in it, and lived in a small housetrailer in the hills of Kentucky with his 16-year-old daughter, Crystal. But the cosmos hath no fury like a Soulmate spurned, and Dgene is out to un-make the dream. "The geography shimmers and melts, catfish as big as boats are pulled from the Mississippi, the moon crumbles into luminous rings and refugees from burning cities choke the highways." (snip) "Kentucky back roads, junkyards, fast food and magic..."
Crystal and a boy named Williams find themselves driving a borrowed Mustang from Kentucky to New Mexico to the North Pole in order to help Talking Man keep his dream (and their world) alive. However, like one of my recurring dreams, the "real" is shifting almost constantly. Whole states disappear, the Mississippi River now runs through a Grand Canyon-like channel, the US-Canadian border is heavily mined, and the names of cigarette and candy brands keep changing. Bisson is kind of the antithesis of Tolkien. He presents his universes as is and without ever addressing the whys. Denver burns, but we never find out what caused this. An owl figurine is an artifact of monumental importance, but the reason is never detailed. Tolkien would obsess over the causes of such things; Bisson ignores them. "There are two ways to tell a wizard. One is by the blue light that plays around his tires when he is heading north on a wet pavement under the northern lights, his headlights pointed toward the top of the world that so many talk about but so few have actually seen. "The other is by his singing." 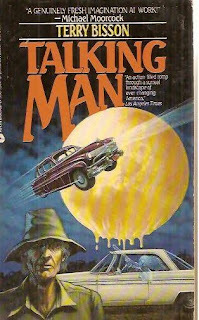 I give Talking Man a B-. It's an engaging story, but in the end I was left with too many unanswered questions. For a change, I wouldn't've minded another 100 pages added to the book, in order to delve into the reasons for everything. Oh look! My good friend Thursday Next from Jasper Fforde's series hopped into this book, and brought me back a photo of the aforementioned "Catfish as big as boats". Thanks, Thursday! "He presents his universes as is and without ever addressing the whys." I haven't read Tolkien. I can't speak to whether or not I like him. However, I think it would bother me not to have the whys, unless it's a world that could easily be concieved. Oh, and that moon is a little creepy. Dude, that's a freakin big fish! How exactly does one pull a beast that size into your boat? Steel rods for fishing line? Amanda - if Bisson wasn't such a great "describer", i probably wouldn't make it thru his books. his not detailing the "whys" is frustrating. and the cover is a bit hyped. no flying cars. the moon changes its reality as the book progresses - develops clouds and breaks up - but i don't recall it melting. Lula - i have my doubts about that fish. 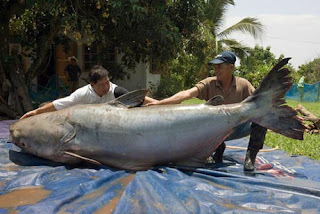 it was at some site that claimed it was the "biggest catfish on record". but i'm thinking Photoshop. That fish reminds me of The Old Man and the Sea. Hehe. I literally just finished reading the 5-minute version of The Old Man And The Sea this afternoon. i never read the book, but there is an old B&W movie of it, and the abridged version parodied its ambiance nicely. I love the book, and it only takes like an hour or two to read. i just remember the Old Man yabbering endlessly to the fish as the boat is being dragged out to sea. i don't recall who the actor was, but i'm betting this movie didn't cost much to produce. put the guy in a boat/prop, make him hold a fishing line, and throw a bucket of water on him every 10 minutes or so.